Tampa Bay Rays pitchers and catchers officially reported for Spring Training to the Port Charlotte Sports Complex on Friday. Many had been here for several days or weeks but this was the “Official” start. 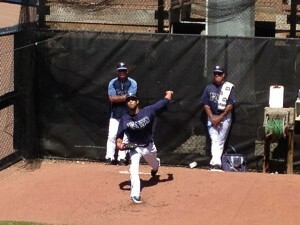 David Price, the team’s pitching ACE was there and happy to be part of the team. He and manager Joe Madden made personal appearances at a local watering hole on Thursday afternoon, signing autographs and conducting interviews for a radio station. It is obvious that Price and Madden like and respect each other and it is evident in the success they each have had with this team. Madden is always positive when speaking of the team which gives the players a great attitude. This year he is talking up a winning season with expectations of another post season of play. The Tampa Bay Rays have an excellent organization and minor league depth other teams can only dream about. From ownership through manager and coaches, this is a great staff with the right stuff to go all the way.